Yes, you read that correctly. 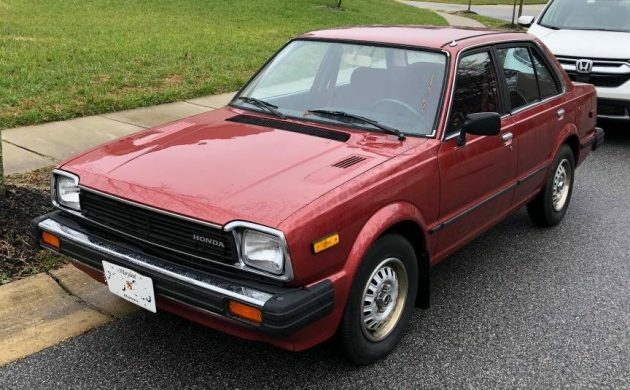 This amazing-looking 1981 Honda Civic, which started its American journey in Texas, is for sale here on craigslist by the second owner in suburban Maryland. With 49,275 documented miles, working A/C, automatic transmission, and plenty of recent service performed would definitely make an excellent turn-key addition to anyone’s garage! 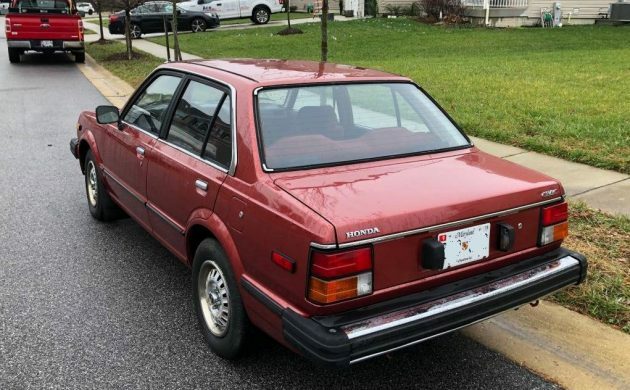 Introduced in 1980 as an ’81, this three-box style of four-door sedan debuted with Honda’s then-new three-speed Hondamatic to replace the two-speed, a minor facelift and was known as the Ballade in its home market of Japan. Built from 1979-1983 in multiple plants around the world, including Japan, Indonesia, South Africa, New Zealand and Malaysia, this model was also built under license in England by British Leyland as the Triumph Acclaim. The seller doesn’t note whether this one is powered by the 1.3 liter or 1.5 liter inline-four that were offered, but both were rated somewhere in the 34-47 mpg range at the time. With a 12-gallon tank, that means between 400 and 500 miles per tank, if your right foot isn’t too heavy. Condition-wise, this looks absolutely fantastic. 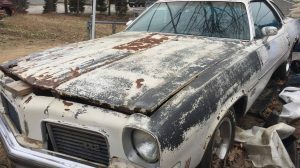 Paint, body, carpets, seating surfaces, wheels – even the exterior trim – look to have been either very well kept or replaced at some point. 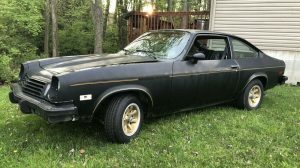 If you’re looking for an economical, entry-level classic, or just something truly unique and a bit rare, this one is definitely worth a look! For posterity’s sake, this should go straight into a museum. 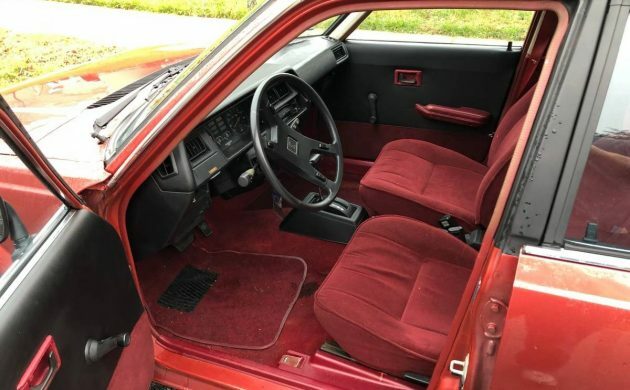 An ’81 Civic in this condition is only a little less scarce than a Bugatti Royale. I can’t believe it’s still there, even though this was just posted. If I had the extra loot I’d already be on the way to pick it up. What do you want for $3750??? This isnt a 81 model. Sedans came out in 82 and 83 which all those came with square headlights. 81 is hatch or wagon with round head light. I found the eBay ad which had the VIN. Decoded the VIN on a few sites and confirmed it’s a 1981 model. I agree, my hatch had round headlamps to. 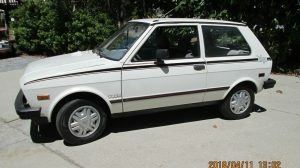 I owned a 1981 sedan exactly like this one for 15 years plus and put 211,000 miles on it before I sold it! Hey man love the civic..i had the 82 wagon 5spd manual…boy that thing was my gem till someone smashed it from the rear while parked….bummer , still hurts till this day…..had only 48k on the dash and i purchased it for only $200 back in 1991 off my buddys Mom. …silver with tbe same bugundy interior. Well found – we had this one in the UK as the Triumph Acclaim, as part of the then Rover / Honda partnership. I’ll add the last sentence, priced at $3,750. 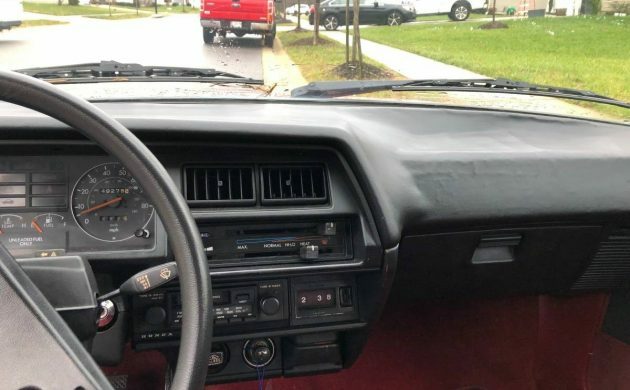 I’m surprised it doesn’t have a under the dash eight track player in it too! Great cheap car to drive car though, It might be sold as I can’t get the ad to come up. Great little Civic find!! This car would have come with the 1.5 L with an automatic transmission. 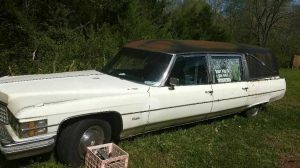 Good luck finding a knowledgeable person to work on that cvcc carburetor to clean it or set it up right. These things ran so clean, cats weren’t needed! Good luck to the new owner and seller!! This is a great little car. I remember when they were fairly common on the road. They seem more charming now.